This is the entire stash we had for our first son. 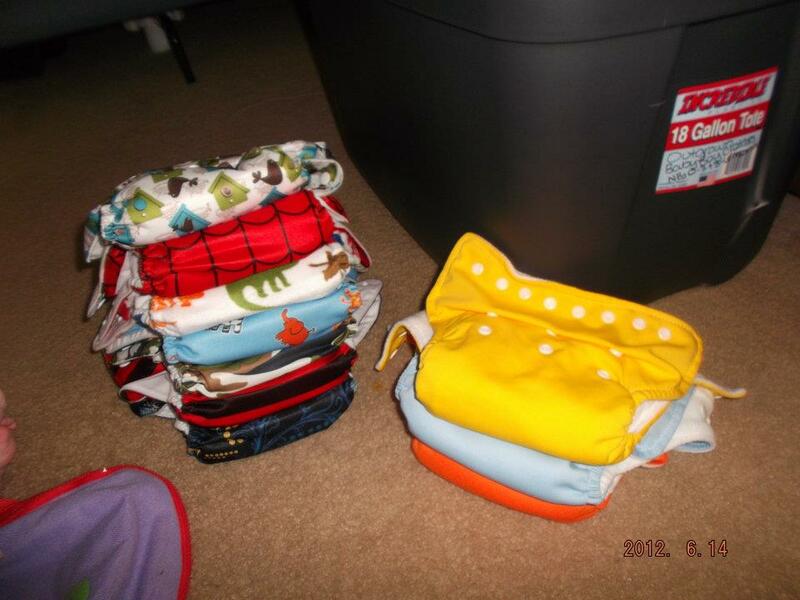 7 Alvababy diapers and 3 babyland diapers from ebay. Yes we were definitely crazy for having this few of diapers and shortly after the 2nd picture date stamp I gave up fully on cloth diapers with my son. 10 diapers is NOT enough diapers even if you wash daily which I had no choice but to do. Granted stains were basically non existant because of daily washing, but still it was a hassle to stay caught up even on those days where I wanted to push housework to the back burner. I am pregnant with the next baby (due in mid-nov) and I’ve already started to get diapers set aside. 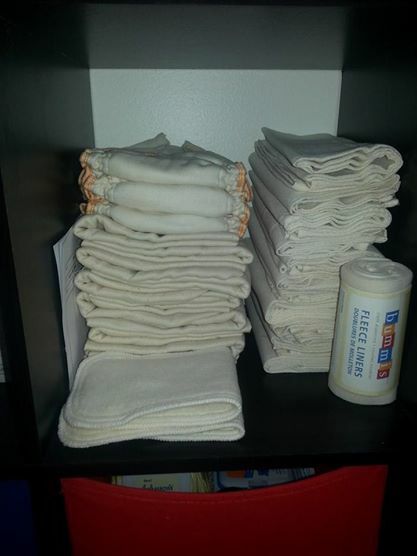 Originally we planned on doing disposable diapers and we had such a nice amount of them stacked in the tiny little closet in baby’s room BUT I started to talk to some friends who cloth diaper and I got really interested in them again. This time around we will definitely have more than 10 diapers. Currently for newborn size we have 30 GMD prefolds, 3 GMD workhorses, 2 small hemp doublers, 12 flat folds, 6 fleece liners, and 1 rumparooz cover. We have 5 Alva one size covers and 3 Alva pocket diapers. I need to get us more of basically everything before November so we are set for the entire diapering years (hopefully only 2 years) but so far we have a decent stash for having to start over again. I did rebuy a print from the old stash that I loved so I’m excited to have that one on this baby’s bottom. 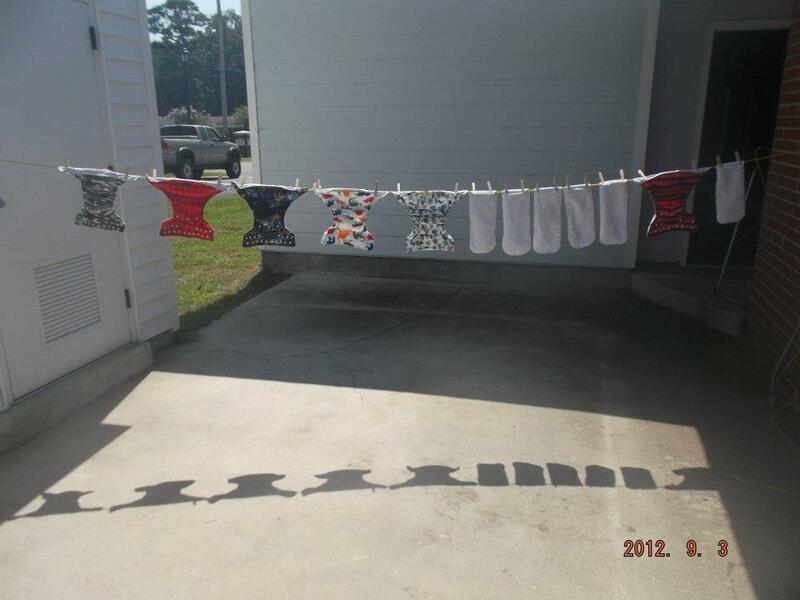 But why cloth diapers? We can afford to use disposables no doubt but its not about what we can afford and what we cannot afford. I would rather have cloth diapers readily accessible than having to worry about “oh no we are out of diapers and baby stinks!” which has happened in the past. On average a person spends between $7-$12 on one pack of diapers and the bigger size the baby gets into, the smaller the packs get. Yes after a certain point the child doesn’t get changed as frequently because they don’t urinate as often, but one pack of diapers generally will last between 3-5 days. Boxes of diapers, one thing I never really purchased because in the end they were more expensive per diaper. Anyways, we will start with the Alva diapers. I do not purchase from a co-op, I purchase from the company directly because once again its cheaper in the end without co-op fees, shipping, waiting around and trusting a random mom. The ones I have are between $3.50-$6.99 a piece. I don’t purchase the bamboo liners, bamboo diapers, none of that. The child is not in them enough for the need of extra absorbency and if they are prepped correctly a standard Alva diaper is excellent! For overnights, we will be using GMD work horse diapers with an added hemp doubler and fleece liner and a cover on the outside to help keep baby dry and all the urine in the diaper. Yes its more expensive than just going out and buying a specific overnight cloth diaper and more work BUT they aren’t bulky, the price still isn’t bad and a diaper cover can be used between 2-4 times a piece in a day unless its actually soiled on the cover. They literally wipe clean on the inside so I will be keeping some kind of sanitizing wipe next to the changing mat so if I need to wipe the inside out, I will be able to. Cloth diapers are very addictive, you have to buy all the cute diapers and you can never have enough (yes you can lol) but everyone knows their limits. You don’t have to go out and buy the diapers that are $20+ per diaper when you need at least 24 to start off with that’s $240 on only 24 diapers not including tax and shipping because most places don’t sell them in stores! The closest store to me that sells them is over an hour away! Hello Amazon!! !